This 7" black leather luggage strap with brass plated steel buckle and three holes securely fastens your luggage tag to your belongings. The genuine black leather strap comes with three adjustment holes. 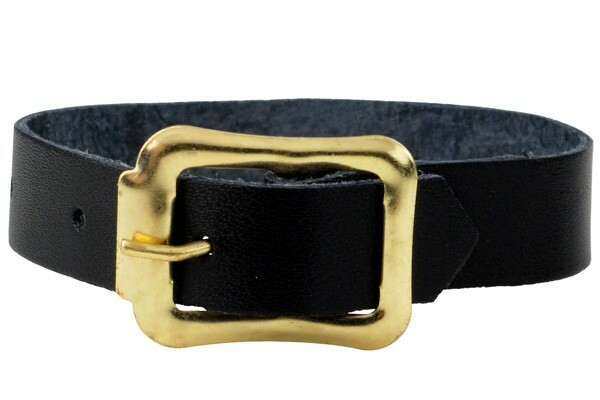 The black leather luggage strap with three holes is finished with an elegant brass plated steel buckle. The executive leather luggage strap is available in black. This leather strap looks and feels premium. I travel a lot and this product is great for keeping my luggage properly tagged and secure. Is it really genuine leather? It's too inexpensive to be genuine leather. You know what they say.. If it's too good to be true, it probably is. These leather straps look good and hold up really well. I never travel without them. This leather strap is perfect for adding tags to our luggages.